The growing competition is helping- with new businesses entering the Indian market, it is helping the category to get the long due attention. The industry “taxi business” which moves passengers across India is emerging at a fast speed with new technologies, on-demand services, urging customers, new marketing trends, and dedicated service providers are all helping it to fortify amongst organized industries and build Indian brands which can expand beyond the borders of India. Consequently, it is the greatest opportunity for mobile app development companies to give a rise to taxi app development to make car rental industry outshine again. In India as well as worldwide, taxi services market is surprisingly unorganized. However, in past few years, companies began capitalizing this market and in meantime, several small and large radio taxi operators proliferated rapidly in the Indian market. Since 2009 the taxi market has witnessed the Compounded Annual Growth Rate (CAGR) of 41.90% in terms of business revenues. Growing consumers disposable income along with lame public transport system in the country has given rise to a new market of on-demand taxi services. Nonetheless, on-demand taxi services market in India has huge potential. There are very few players in organized radio taxi services who have unsuccessfully addressed the demand due to unavailability of a required number of cabs. It is expected that Indian radio taxi service market will reach 30000 taxis by 2017. The company such as Meru Cabs has resulted in 120% increase in net profit after tax which shows the on-demand taxi services has great future in India. A smartphone and a good Internet connection are almost every individual needs nowadays to fulfill entire spectrum of his/her daily needs. Well, tech-savvy Indians have apps just for everything. From movie ticket booking to scheduling physician’s appointment, ordering groceries to book a cab. The on-demand taxi trend has truly changed a huge portion of people in country who commute on daily basis. The hour-long waiting and shelling out excessive prices for the services of a neighborhood is now over because of on-demand taxi services. Zoomcar: From a Nano to Mercedes, Zoomcar is a well-known car rental service provider in which customer can take and drive it by himself/herself. Ola Rentals: It provides multiple types of vehicles. Launched in 2016, their attractive pricing makes them a suitable option for those who want to shop around the city, attend special events, or make a family visit. Uber Hire: Uber is best for those who have to make multiple stops while traveling across the city. It is perfect time based on-demand service operating across 8 major cities in India. Though taxi business has great future ahead, it is still full of different challenges. This industry is bursting at the seams with competition as many cab aggregators have emerged in last few years. So let’s have a look at those challenges and what it really takes to be a leader. taxi booking app means only in an app-only mode. Thus, users have no other option but to download their app. Even if smartphone users are plenty in numbers in India, not all are comfortable to flood their device with multiple apps. Confining to just app only mode will make people look out for more convenient options. 2. Cashless Payment: Many cab aggregators are tying up with digital wallet companies to opt cashless payments. However, many customers love to enjoy benefits like cash back offers and discounts, they are not still ready to go cashless way. While many still have fear of fraud and hacking with the cashless payment method. Thus, people still prefer cash payment method for their rides. 3. Pre-booking Facility: Here is one of the biggest drawbacks that many taxi app solutions still lack the feature of advance booking. You don’t want to waste time tracking cabs when you have to rush to airports or pay four times the regular amount during peak hours. The next five to ten years will witness a boom in the industry, which will outclass the old players present in this segment. 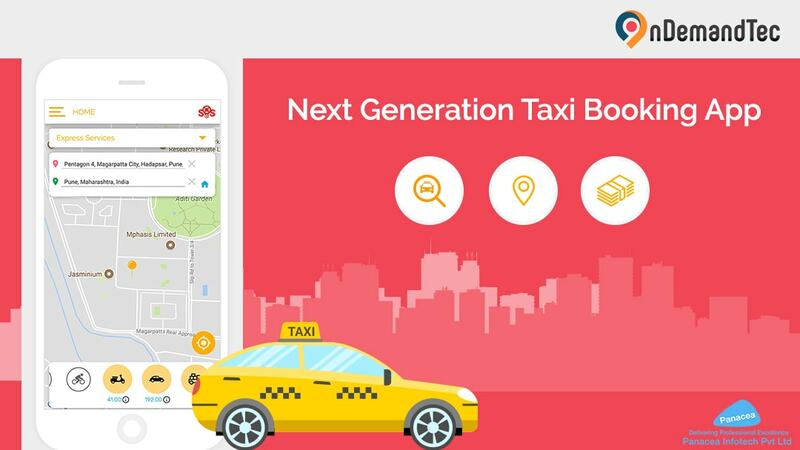 Owing to this cut-throat competition, the taxi app development company is going an extra mile to ensure that every need of the customer is kept in mind. Apart from conventional car rental companies, there is a lot of direct and indirect competition on the anvil. With a difference in the business model, entry of new players changes from the separate fleet to hourly rates to just being intermediary connecting drivers with passengers. For example, we have developed a brand new Cab Booking App – OnDemandTec. We have thoroughly analyzed current Car Rental Market and overcome all existing challenges in it. Some of this competitor neither own the vehicles nor maintain them, but only act as a marketplace. However, one will be able to be a long-term player and benefit from operating a substantial fleet with a wide range of options. These options need to be centric to the needs and want of the consumer and innovative enough to re-define their choice as well as ground transportation in India.